There are times when you don’t want as much bait as a Method feeder typically delivers, but do still need something near your hookbait, and this is where the new Guru Impact Bomb comes into its own. The Impact Bomb is basically a flat pear shaped lead with a hole in the middle of it and a cage which bait can be pushed into, so that it will will stay in situ during the cast, with the majority of it ending up close to your hookbait – determined by how long your hook length is. These bombs have a wide variety of different uses, both on lakes and rivers, and the ‘cage’ can be filled with Method mix or dampened pellets to deliver a scent trail close to your rig. 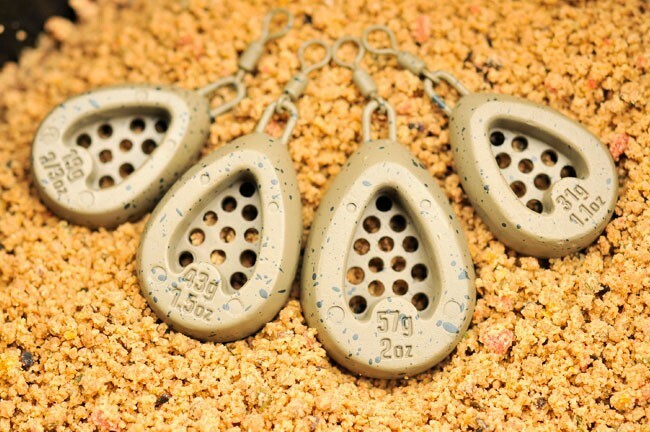 This is especially useful when you are considering fishing a straight lead but still want some bait in the area, so will also be a good choice in the colder months.They come in four different sizes – 2/3oz, 1.1oz, 1.5oz and 2oz – which covers everything from flicking a lead down the margins to fishing at longer range, or holding bottom on slower flowing rivers. Their shape and weight-forward design also means that they cast incredibly well, and accurately, and are less susceptible to catching a crosswind than a conventional Method feeder can be. The Impact Bomb is finished in Guru’s ‘commercial camo’ coating and comes with a swivel attachment, making it suitable for use with a variety of different set ups, including on a lead clip, running on the main line, or on a paternoster.